This page is a tribute to Grantham railway staff who, sadly, never came home after going on duty, and also to railway passengers whose journeys ended unexpectedly and tragically in the Grantham area. The idea came about through conversations with people who talked about a member of their family, or a workmate, who lost their life on the railway through accident or who died of natural causes while at work. It seemed to me that Tracks through Grantham should help to remember these persons by gathering their names and briefly recording the circumstances. The railway can be an unforgiving environment. With just a moment's inattention, or maybe a minor misjudgement, the most experienced person might put at risk their own life and/or the lives of others. On the railway accidents may occur unseen in the dark, or at remote locations where there is no one to raise the alarm or to speedily render First Aid. In the days before modern antibiotics a casualty might appear to be recovering from a survivable injury, only to succumb to infection despite receiving the best care available. The list begins as early as the 1850s, soon after the railway arrived in Grantham. Railway staff from the Grantham area who died while on duty, in the Grantham area and elsewhere, either as a result of accident or of natural causes . Important sources for the earliest incidents are reports in the local newspaper The Grantham Journal. For incidents within living memory, personal recollections have frequently been the starting point. We have copies of the source material and will gladly share it with anyone who wishes to learn more of the background of a particular incident. This is very much a 'work in progress'. If you are able to add to our knowledge, including the correction of any errors, and you would like to do so, please get in touch. Isaac Potter, a tip driver, died after his leg was run over by a spoil truck while working in the hours of darkness during the construction of Ponton cutting. Robert Daniels, a porter, was knocked down by an engine at Ponton station. His death was registered in the third qurter of 1852. A labourer named Fox was knocked down by an engine on the northern approach to Grantham station. Edward Musson of Horncastle, a shunter, was struck by a train at Grantham. Thomas Tompkins from Somerby in Leicestershire, a labourer for a contractor to the Great Northern Railway, was struck by a train inside Stoke Tunnel while walking through with others after they had finished work. George Stephenson of Grantham, a platelayer, was run over by a train near the bridge over the Barrowby Stream. Edward Kemp, a cattle dealer, fell into the coal drops at Grantham station during the hours of darkness. William Collins of Grantham, a carriage cleaner, was run over during shunting at Grantham station. Joseph Harding, a guard from Doncaster, was crushed between a locomotive and a wagon during a conflicting shunting movement in a siding at Grantham. Henry Parker, a goods guard thought to be from Nottingham, died of natural causes at Grantham station. William Layton of Grantham, a driver, died of natural causes while on duty in Grantham station yard. Arthur Casburn of Peterborough, a railway fireman, and passenger Henry (John) Crawford, a joiner from Derby, died when two trains collided in fog at Barkston Junction (later Barkston South Junction). The body of foreman platelayer John Dewy was found on the line near Belvoir signal box in the early hours of Sunday 24th March. The inquest concluded that he had been struck by a train. Though Dewy's accident occurred outside his normal hours of employment, he was authorised to be on the railway at any time without being considered a trespasser. George James Frederick Russell of Grantham, a brakesman, died in the wreckage of a derailment at Barkston Junction (later Barkston South Junction). George Lemon, a foreman bricklayer of Helpston, near Peterborough, was struck by a train inside Peascliffe Tunnel. Joseph Bellamy, Grantham stationmaster, caught a cold while on duty which developed into bronchitis. Other complications ensued and he died on 1st April. He was 41 years of age and left a widow and seven children. Charles Downing, a driver of Nottingham, having been struck by a locomotive, received an injury to his foot which required its amputation; he died on 16th August from an infection. Joseph D. Winter, a blacksmith of Grantham, was run over by a train near the north end of the Nottingham platform while attending to a fault with the down side water column. Eli Addlesee, a driver of New Somerby, Grantham was struck and run over by moving wagons near Grantham South signal box. John Spaul of Grantham was assisting a boilersmith with repairs at Grantham Loco when he was crushed between locomotives during shunting. John Huckerby, an elderly passenger of Granby, Nottinghamshire, was struck by a train when using the sleeper crossing at the south end of the platforms. James Greasley, a fireman of Doncaster, struck Belton Lane Bridge soon after leaving the south end of Peascliffe tunnel. Henry Upton, a railway labourer of Great Gonerby, fell under a train at Spittlegate cutting, south of Grantham. John James Peacock, a platelayer of Grantham, was struck by a locomotive while clearing snow from points near Grantham South signal box. His wife had died a month before and they left a family of 10. James Goode, a platelayer of Peterborough, was working with a track relaying gang near Little Ponton when he failed to stand clear of an approaching Grantham to Peterborough train. John A. Scholey, a point holder of Bardney, near Lincoln, was riding on a locomotive footstep during shunting. He stumbled on stepping off, was hit by a carriage and fell under the train. Richard Hillyer of Grantham, a driver, was injured in a collision between two locomotives near Grantham North signal box. He died of his injuries on 2nd September. Arthur Kirk, a labourer at Grantham Gas Works, was crushed against the retort house door at the gas works by a moving coal wagon. He died from his injuries on 10th September. John William Frisby, a shunter, was struck by a train on the Up Main line south of Grantham station. Richard James Huggins, a horse shunter of Grantham, was hit and run over by a train which was being shunted into the Nottingham platform. Woodbridge Leonard Watson, a bridge erector aged 18 of Manchester, was working on the reconstruction of Springfield Road bridge when he was struck by a train while crossing the main lines. George Bertie, a fireman from Doncaster, struck his head on bridge No. 276 near Westborough probably while retrieving, in darkness, a fire iron from the locomotive's tender. He died early the following day. There is more about this accident in our section on people and incidents in the history of Grantham North signal box. Thomas Stanton Pizer of Grantham, a Shunter, suffered serious injury to his hands and arms in a shunting accident during the hours of darkness in the west (Down side) goods yard. He died from septic poisoning on 27th October. John E. Docking, a goods guard of Netherfield, Notts, was struck by a train near Grantham Yard signal box. Thomas Henry Meredith, a platelayer of Grantham, was struck and run over by a train at the south end of Grantham station. Passenger Sgt. Joseph Rushforth, a miner and reservist in the Durham Light Infantry, fell from a train at Little Ponton; he died the following morning. Harry Woodhead, a carriage fitter of Grantham, was crushed between carriages in the carriage sidings while carrying out repairs to a steam heating pipe. John Thomas Perkins, a platelayer of High Dyke Cottage, was knocked down by an engine near the north entrance of Stoke Tunnel. Private Andy Chenwith, a soldier in the Royal Army Medical Corps travelling home on leave, appeared to have fallen from a northbound passenger train south of Peascliffe Tunnel. George Ivan Wood, a locomotive cleaner and spare fireman, was crushed between two locomotives while cleaning at Grantham Loco (engine shed). William Ryder Rawding of Grantham, an ash filler at the Loco, was knocked down and run over by a locomotive in the Loco yard and he died of his injuries on 6th July. William Earnest Moreton, a platelayer of Gonerby Hill Foot, was struck by a train near the North Parade bridge at Grantham. Thomas William Hoyes of Gelston was the driver of a baker's van which was struck by a train between Barkston East Junction and Honington while using a gated level crossing worked by a crossing keeper. At about 6.15am two locomotives were travelling north at speed through the darkness of a bitterly cold winter's night. In Peascliffe Cutting, on the approach to Barkston, they collided with the rear of a stationary ballast train. A brake van at the rear of the ballast train was completely destroyed in the collision. Twelve permanent way men were in the van. Five of the men died at the scene, a further three passed away in hospital soon afterwards, and the four who survived all received serious injuries. All the casualties were married men from the Grantham area and several had young families. 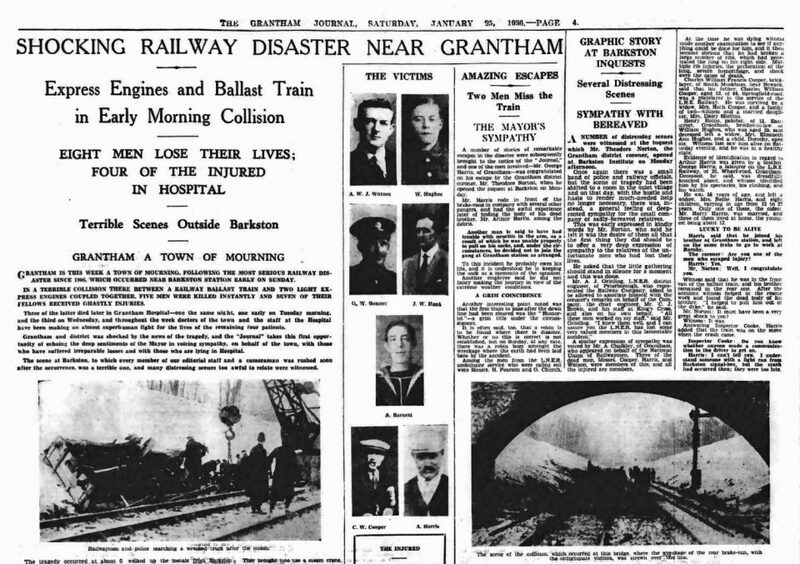 The accident of January 1936 at Barkston therefore had a profound and lasting effect on both the town and its railway community, much more so than the better known Grantham high speed mail train derailment of September 1906 in which no local people were injured. and there's a recording of a radio programme about the accident here. See also an extract from coverage in The Grantham Journal at the head of this page. Platelayer Thomas Bullimore of Grantham was struck by a train in Peascliffe Tunnel. William Dennis, a lengthman of Grantham, was struck by a train inside Peascliffe Tunnel. He was with a group of men who were travelling to carry out track repairs inside the tunnel. They were in a brake van at the rear of a works train which had stopped in the tunnel, when another train was heard approaching from behind. At the inquest into William's death it was said that he appeared to become anxious, perhaps fearing a repeat of the fatal rear-end collision involving a works train at Barkston three years before (see above). William had survived the Barkston accident and he'd been a bearer at the funeral of one of its victims. He and two other men descended from the brake van and he was struck as the train passed on the other line. George Cooper, a joiner at Ruston & Hornsby's engineering works in Grantham, was crushed between two wagons during shunting at the factory. Walter Everton of Grantham, a platelayer, was struck by a train near Grantham North signal box. Between late 1940 and 1942 Grantham regularly received attention from the Luftwaffe, mainly because of the British Manufacture and Research Company (BMARCo) works - known locally as 'Marco's' - on Springfield Road, near the Loco. The factory made 20mm cannon for the RAF's Hurricane and Spitfire fighters. On 3rd December 1940 during a daylight low-level bombing attack an enemy aircraft was engaged by the BMARCo factory defence guns. The plane was hit, damaged and driven off. One of its bombs landed in the Down Goods Yard, but it failed to detonate. Lt. John Ernest Gilkes aged 32 of Leamington Spa, serving with the 3rd Bomb Disposal Company, Royal Engineers, was killed the following day when the bomb exploded while he was attempting to make it safe. There is more in our page on Grantham's railways during World War 2 and on the Royal Engineers' Association memorial pages. Blanche Arthur of Swayfield was helping her husband, a baker, with his delivery round in very thick fog. She was knocked down by a locomotive and brake van while opening the gates at Park Farm Lane level crossing near Colsterworth on the High Dyke branch. At about 3.15pm a King's Cross to Newcastle train departed from Grantham, having changed locomotives there. On the footplate of Heaton (Newcastle) based V2 locomotive No.4779 (later No.808 and finally No.60808) were Grantham driver Ernest (Ernie) Smith and his fireman. The last three vehicles in the train were two open third class coaches followed by a full brake. The open thirds were occupied by a party of about 100 boys returning, following the Easter holiday, to Ampleforth College, a Roman Catholic boarding school in North Yorkshire. Shortly after passing Hougham the communication cord was pulled, and driver Smith stopped the train as it approached Westborough signal box, between Hougham and Claypole. The second last coach was on fire and the flames quickly spread forward and back. The last three coaches became completely burned out. Six of the boys were unable to escape and perished. Seven were taken to hospital. The inquest and enquiry determined that the cause of the fire was lighted matches which some of the boys admitted they had been throwing about the carriage. The first two casualties listed below were sons of Hubert Pierlot, the Belgian Prime Minister, who was in London leading the Belgian Government in exile. A third son was among the injured. Arthur K. Parker of Grantham, a Loader in the Goods Department at the station, was crushed against a wall in the goods yard, near the weighbridge, by a motor lorry. Thomas Booth of Grantham, a goods guard, was struck by a locomotive at Great Ponton and died in hospital the following day. Two of his sons, Joseph (Joe) and Walter, were railwaymen at Grantham. John Bone, a shunt-horse driver of Grantham, was moving two wagons away from the goods shed towards some other wagons at night. The horse became startled by steam blowing off from a nearby locomotive, causing it to bolt. John was caught by the tail chain, part of the towing tackle, throwing him into the gap between the two sets of wagons as they came together. He died from his injuries on 2nd February. There is more in our page on Grantham's railways during World War 2. Harry Shardlow of Grantham, a fireman on a Scotch express, struck a bridge at Woolmer Green, Hertfordshire, while fixing an anti-glare sheet between the locomotive's cab and its tender. Anti-glare (or 'blackout') sheets were used during wartime to reduce the visibility of the glare from the locomotive's fire to enemy aircraft. They were fastened into place by the fireman at dusk. Driver Percy Amos Meade of Grantham was crushed between a locomotive and the coaling plant in the locomotive yard. He was attempting to climb aboard the locomotive, No.2581 Neil Gow, which had started to run away in the loco yard due to defective regulator and brakes. Edward Kew, a porter, died of natural causes at Grantham station. Lewin Soons, a signalman of Great Gonerby, died of natural causes while working in Barrowby Road signal box. He had been on duty at Barrowby Road box on the morning of 19th January 1936 when the tragic accident near Barkston took place (see above) and he gave evidence at the Enquiry. George W. I. Walker, a railway lorry driver aged 66 who was was officially retired but had continued to work, died of natural causes soon after arrival at the weighbridge office. He had worked on the railway at Grantham since 1913. Peter John Baxter from Grantham and Filip Janczarek, a Pole living in Peterborough, both permanent way lengthmen, were working on the Up Main line when they were struck by a train at High Dyke, near the entrance to Stoke Tunnel. Peter had been on the railway for only three weeks. Ivan Kenneth Gadsby, a young railway fireman from Derby, was crushed between a locomotive and the coaling plant in the locomotive yard. George H. Ward, a driver of Grantham, was killed along with driver Cyril Roberts of Lincoln when the railcar (diesel multiple unit train) they were driving collided with a locomotive at Bracebridge Gas Sidings in Lincoln. As a young locomotive cleaner George had been a witness to a fatal accident involving fellow cleaner George Wood which occurred on 27th July 1920 at the Loco (see above). Grantham driver George Taylor died of natural causes while on the footplate of a diesel locomotive at Peterborough. Guard Frank Mapletoft fell from a train heading for Nottingham while attending to a carriage door between Gonerby Tunnel and Allington Junction. Driver William Richard (Billy) Bell of Grantham died of natural causes while on the footplate of a diesel locomotive at Grantham station. I am most grateful to you for this historic tribute to those who have lost their lives in train accidents in the area of Grantham. My husband's first cousin, Peter May, was killed in the fire on the Ampleforth school train on 28 April 1941 which happened to be his father's 56th birthday. His 14-year-old brother, Ralph May, survived the fire. He went into the army. His mother was killed in January 1945 when a V2 struck the Royal Hospital Chelsea where his father was a Captain of Invalids. Ralph May was greatly affected by both these tragedies but was a courageous person. He died in 2012. Thank you very much for your comment and for sharing with us how Peter’s brother, Ralph, was affected by being involved in the accident himself. The legacy such tragedies leave with survivors and witnesses, for the remainder of their lives, is sometimes not fully appreciated when we read historical accounts. Albert Kimpton [a victim of the high speed derailment of 19th September 1906] has a very attractive memorial in Great Shelford churchyard, with a carved angel standing 7 or 8 feet high with a bowed head. I attended the school next door in the 1970s, and it was rumoured that if you looked into the angel's face its eyes flashed. It was a common to dare somebody to go "over the wall" into the churchyard and look at the angel's face ... but hardly anyone ever had the courage to do so. Thank you for telling us about Albert's memorial, Jeremy. Following up your lead I discovered a photograph here. There has been so much written, even quite recently, about the cause of the accident, and I've felt that the victims' stories have become overlooked. So thank you for getting in touch about this most personal connection with the Grantham accident of 1906.